Available either as just the frame with no stocks or frame assembly including stocks. All include warranty, papers, manual, and lock. $50 Off Your First Accuracy Barrel® - Order your T/C frame from us and get a coupon for $50 off your EABCO Accuracy Barrel® order... Start your barrel collection with The Best! Package Deal Action Job - Our gunsmiths do a fantastic job to make these factory triggers smooth and crisp to improve your accuracy. Order together for a $10 discount. Thompson Center Encore, Pro Hunter, and Contender are the most successful switch barrel platforms in history! Use the same frame, and interchange barrels from almost a hundred rifle & pistol calibers: rimfire, centerfire, shotgun, slug & muzzleloader! Frames fit either Encore/Pro Hunter or Contender/G2 barrels and accessories. 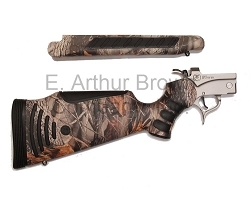 Purchase your Frame Assembly complete your rifle with a barrel, stock, forend. Or, simply order the rifle action alone with your choice of stock. Pro Hunter frames are engraved with "Pro Hunter" logo on the receiver and a swivel hammer for thumb clearance on low mounted scopes. We are not only your preferred TC retailer... At EABCO, our Expert Gunsmiths manufacture Premium and Custom Accuracy Barrels for your Encore & ProHunter. Order your T/C frame here, and we'll include a coupon for $50 off when you order on EABCO Accuracy Barrel®. Collecting barrels is a big part of the fun of owning a T/C Encore, Pro Hunter, or G2/Contender! $10 Off Stock Sets - We offer a wide variety of TC factory stock sets, laminates and tactical styles. If you would prefer a different stock for your new frame, add them to your new frame order and get a $10 discount off our regular price!